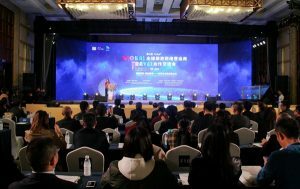 The opening ceremony and main forum of the 6th Global Travel E-commerce Conference were held in Dujiangyan, a city within the Chengdu metropolitan area in China’s Sichuan province, on November 16. The event was co-hosted by Chengdu Municipal People’s Government and Sichuan Provincial Department of Culture and Tourism and jointly organized by Dujiangyan Municipal People’s Government, the Tourism Bureau of Chengdu and the Tourism Information Center of Sichuan Province. Sichuan Provincial People’s Government Vice Governor Yang Xingping delivered the opening speech at the event, alongside speakers Sichuan Provincial Department of Culture and Tourism deputy director Song Ming and Chengdu Municipal People’s Government Vice Mayor Wang Pingjiang. his year’s event, themed “Data Insight and Intelligence-Driven ¨C Create and Share the New Cultural Tourism Ecosystem”, focused on exchanges and discussions concerning navigating the emerging trends arising from innovations in the tourism industry, promoting the application of new technologies and providing access to resources available in both the upstream and downstream segments with the aim of transforming Sichuan into an international tourism destination. Attended by global tourism leaders, the event demonstrated the progress taking place across, as well as the characteristics of and trends in, the province’s growing tourism industry from a big data perspective. Pacific Asia Travel Association (PATA) CEO, State Councilor, Academy of Sciences for the Developing World member and Tianfu Big Data International Strategy and Technology Research Institute president Shi Yong, Tencent Cloud vice president Wang Tao and industry head for Chinese brands at Google Ling Chen, among other leaders in the tourism and tourism-related sectors, delivered keynote speeches at the event. Over 500 representatives from more than 300 leading global companies with a presence in the tourism market attended the event as invited guests, including Expedia, Airbnb, Travelzoo, Lvmama, Ctrip and Tuniu. Councilor Shi Yong’s speech entitled “Big Data Analysis and Smart Tourism” received widespread positive feedback from attendees.